All philosophical systems of the world are nothing but the study of the relationship between the physical, mental and spiritual dimensions of creation and giving justification for the acceptance or rejection of any one or two of the three. 2. The soul or the final phase of Mind is represented by (S). 3. 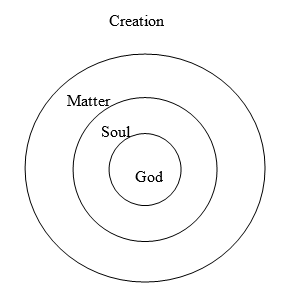 The cause for creation, sustenance and destruction of creation is Represented by God (G). The relationship can be said to be (M+S+G). It has two values zero and infinity. 1.M+S+G = 0. When creation has yet to happen or at the end. 2.M+S+G = infinity. When creation is evolving to its ultimate goal. In terms of Vedic India, the above M,S,G concept is termed as Cit, Acit and Iswara. Cit means life or the soul (S) Acit is that which is without life, that is inanimate matter (M) and Iswara is the force that encompasses and permeates both Cit and Acit (G). Coming to the culture of this country which spans thousands of years, it is very difficult to trace in detail the quest of India in determining the source, course and goal of creation and the role that one has in this grand play and display of creation. Fortunately our forefathers have kept, despite it being the Sruti parmapara i.e. Oral tradition, the method of transferring of knowledge through the word of mouth rather than through writing if not in detail, at least in the summary form, so that we can fairly accurately trace the growth of the spiritual thought and its impact on the individual and the society as well. The ancient seers of India in their search for the eternal truth that forms the very basis of creation, being dissatisfied with the anthropomorphic con¬ception, gave up searching for the Divine in the outer world of sense and matter, and turned their attention to the inner world. Is there an inner world? And what is it? These inner quests lead them to the Atman and then on to the very basis of reality. Later, over thousands of years many a seer ruminated and created a whole mass of literature grouped under the term Vedanta. Thus Vedanta is, the very flower of all the speculations and experiences and analysis, embodied in that mass of literature collected and culled through centuries. This Vedanta as we see today has gone through many modifications and embellishments. And as time progressed the mass of accumulated information had to be condensed and structured in order that posterity can retain it. Hence the Vast literature of the Vedas led to the creation of the Upanisads and they to the Brahma Sutras and finally to the famous song celestial, the ‘Bhagavad Gita’. The Upanisads are those that extract from the Vedas the absolute aspect of the Vedic knowledge. They are the most concise expressions of all the core knowledge that is in the Vedas. The Brahma Sutras are an exegesis of the Upanisads explaining the meanings, reconciling seeming inconsistencies and establishing basic propositions. Acarya Badarayana is the author of the Sutras who is none other than Bhagavan Krisna Dwaipayana Vyasa, the author of Mahabharata. There was a period in Indian philosophy known as the Sutra period. It was in this period every branch of knowledge that was in vogue was reduced to sets of formulae, so that it was easy to remember. It was the earliest method of the so-called modern IT compression technique, where instead of mathematical symbols meaningful words used to compress enormous amount of information in simple Sutras. The Brahma Sutras or aphorisms deal with the nature of the creator and the creation, the process and the goal of creation and also its relevance to us. For, in Indian philosophy purposeless dry discussion, arguments for arguments sake were frowned upon. The Brahmasutra contains four Adhyayas (chapters) having four padas (sections) each. Each topic is discussed in the light of five constituent elements 1) Visaya subject of discussion 2) Samsaya doubt 3) Purvapaksa objector’s view 4) Siddhanta conclusion 5) Prayojana advantage accruing to either party. Bhagavad gita is the song celestial that Lord Krishna gave to Arjuna in the battle field which consists of all the essence of Indian philosophy and also a primer about right conduct and right behavior that one should follow in order to get liberation. There has been many scholars and realized souls who have commented upon these texts in one time or the other. But it so happens very rarely, there has been an attempt to reconcile all the three texts into a single mould. In the history of India so far, only three people have been accorded that recognition. 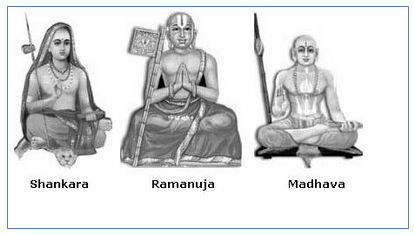 They are Sankaracarya, Ramanaujacarya and Madhvacarya or Ananda Tirtha. Acarya is he who culls out the essence of the sacred texts, not only persuade others to follow but also follows it himself. All the three acrayas were the very embodiment of this dictum. They are revered as paramacaryas, as the supreme acrayas because they were the only three who completed this mighty task of unifying the Prasthana trayee into one tangible structure in the last two thousand years. 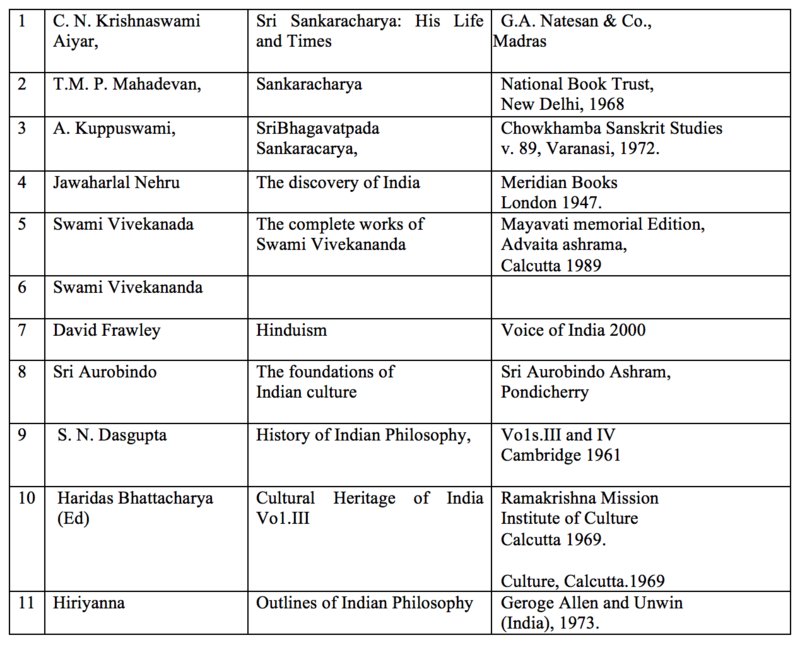 Their work is the basis of today’s Indian religio-philosophical structure. One will understand the stupendous task that only these three and none else could do when we realize the challenge that they took upon themselves in sprit of service rather than as an originator of a new school of thought. It was only in the later period that we find the hardening of attitude among the followers of the acaryas and a stubborn attitude not to recognize the greatness of the other. The task they took up was to say the least was stupendous. First they had to show how the Brahma Sutras, which number around 550, is consistent with each other and also justify the sequence of the sutras. Then they had to reconcile the sutras with that of the twelve-principle upanishads. Then in turn the whole thesis had to be reconciled with the statements of the Bhagavad gita. Off course the whole structuring of each one’s thesis should not flout the basic rules as expounded by the six systems of sastras (saddarsana), which are meant for the analysis of the sacred texts. On top of it the acid test was that the doctrine propounded by them should also be valid in terms of human experience and immensely practicable The practicability being justified with the help of the Itihasas, namely Ramayana and Mahabharata. Hence it becomes obvious to any one why we have had only three Acaryas in the last two Millenniums. Sankara was born to the Namabudari brahmana couple, Sivaguru and Aryamba, in a little village called Kaladi in Kerala, by the divine grace of Lord Sankara. Though the date of Sankara is still under dispute, many scholars have come to a consensus that he was born not later than 2nd century A.D.
Sankara was filled with the spirit of renunciation early in his life and took Sannyasa at a very young age. Sankara then traveled far and wide in search of a worthy guru, till he came to the banks of the river Narmada in central India. Here was the Asrama of Govinda Bhagavatpada. Seeing the intellectual acumen of his disciple, Govinda commanded Sankara to expound the philosophy of Vedanta through commentaries on the prasthana trayee. At this time Sankara was barely a teenager. In this period, Sankara wrote commentaries on Badarayana’s Brahma Sutras, the various Upanisads and the Bhagavad Gita. These commentaries, called Bhasyas, stand at the pinnacle of Indian philosophical writing. He also commented upon the various other texts including the Vyasa’s bhasya to patanjali’s yoga Sutras. Sankara at the age of 32, retired to the Himalayas and disappeared inside a cave near Kedarnath. This cave is traditionally pointed out as the site of his samadhi. According to Sankara Bhagavatpada, Brahman has no attributes or qualities. He is nothing but absolute consciousness. It is one, indi¬visible, without a second. The Jiva is Brahman himself. But due to ignorance or Maya the jiva or soul thinks that it is different form Brahman. Hence he feels bound and once this ignorance disappears the soul realizes that he is Brahman. Thus the apparent duality ceases, and the Jiva no longer retains the wrong notion that he is a separate entity. Hence transformation is only by the dawning of wisdom for the Jiva and nothing else. As Sanakra Bhagavatpada was the proponent of the thought that there are no two entities like jiva and Brahman and that in reality Brahman alone exists, his school of thought is called ‘Advaita’ –that which is non dual. If we apply our formula M+G+S to Sanakara Bhagavatpada’s philosophy we can say, in the ultimate sense M = 0 non-existent and S = G there is no difference hence it is 0+S+S =0 or 0+G+G = 0 in the sense nothing identifiable or quantifiable exists. Bhagavan Ramanuja is the formulator of what is popularly known as the Visistadvaita School. He was born in 1011 C.E. at Sriperumbudur near Chennai to the couple Sri Asuri Kesavacarya and Bhudevi. Due to the early demise of his father he migrated to Kanchipuram and started his education under the tutelage of Sri Yadava prakasa, a famous advaitin who propounded his own school of advaita known as Yadavadvaita. But Ramanauja an affectionate soul as he was, was not happy with the teachings of Yadavaprakasha. He was attracted towards the ideas and concepts as propounded by Yamuna a leading monk who advocated a separate school of thought. Bhagavan Ramanuja gained the entire fundamentals and rudiments of the thoughts of Sri Yamunacarya through the help of Yamunacarya’s principle disciples, as he was unable to meet Yamunacarya while he was alive. At the ripe age of sixty Bhagavan Ramanuja started writing the commentary on the BrahmaSutras under the title `Saririka Mimamsa Bhasya’, popularly called as `Sri Bhasya’. He traveled again all over the country and visited almost all the famous pilgrim centers of India. As he was an advocate of Pancaratra Agama, he persuaded the temple authorities in many of the pilgrim centers to adopt the Pancaratra system of worship in their temples. He was instrumental in establishing the five famous Narayana temples in Karnataka with the assistance of the Hoysala king Visnuvardhana. His creation, the famous Tirumalasagara, a huge water reser¬voir near Melukote, the discovery of the Narayana Idol at the Yadavadri, now called as Melukote in Karnataka, and the acquisition of the arcamurti (processional idol) for the temple, all these have become folk legends in Karnataka. It was also here that he gave the authority of temple entry to the un¬touchables belonging to the Jambavas and Adidravidas and named them as `Tirukkulattar’ (People of the divine family) in recognition of their yeoman services in bringing the Arcamurti `Ramapriya’ and renovating the temple at Melukote. After staying for nearly twenty years at Melukote, he returned to Srirangam at the age of eighty and supervised and streamlined the temple administration at Srirangam and made it the headquarters for Srivaisnavism. Bhagavan Ramanuja introduced many innovations like the introduction of the singing of the Divya prabandha as part of the temple ritual, arranging different utsavas for the Lord and so on. He left for the divine abode at the ripe age of 120 years at Srirangam. In all, he wrote nine works namely 1.Vedartha samgrahah, 2.Saririka Mimamsa Bhasyam or Sribhasyam, 3.Gitabhasyam, 4.Vedantadipah 5.Vedantasarah, 6.Saranagati gadyam.7.Vaikuntha gadyam 8.Sriranga gadyam 9.Nityagranthah. The most striking feature of Bhagavan Ramanuja’s thought is the attempt to unite personal theism with the philosophy of the Abso¬lute. The philosophy of Bhagavan Ramanuja indicates a philosophy of a personal God, who is one but characterized by attributes (Visista). The non sentient nature (acit) is devoid of consciousness. The sentient nature (cit) consists of living beings, plants, animal and human beings. Cit and acit are the two aspects or modes (Prakara) in which God manifests himself in this visible universe. These are the tattva trayas or the three truths Cit, Acit and Isvara that Bhagavan Ramanuja elucidates in his Sri Bhasya. The Isvara or God of Bhagavan Ramanuja is free from all defects and is a storehouse of all beneficent attributes. Ramanuja’s God is easily accessible to the devotee because He is the veritable ocean of affection. Isvara or God is the indweller of the souls as well as that of the physical universe. According to Bhagavan Ramanuja, the ultimate goal of life is to have the vision of the Paramatman, Sriman Narayana who is Brahman himself, which is possible only if one cultivates good tendencies that leads to the surrender to the divine. Attaining and enjoying the presence of Lord Sriman Narayana, the Isvara of Ramanuja, is Moksha or liberation. Generally his philosophy is called as Visisitadvaita as he espouses a Brahman with attributes. If we apply the M+S+G to Bhagavan Ramanuja’s doctrine, all the three are valid as long as creation happens and even in the end despite M & S becoming zero the value of G remains infinite. Hence B+S+G = infinity, irrespective of the state of creation. Srimad Anandatirtha also known as Madhvacarya is the founder of the school of thought popularly termed as Dvaita Vedanta, a major school of Vedanta Philosophy. Srimad Anandatirtha was born in a village called Pajaka ksetra, about eight miles southeast of Udupi, in the Udupi District of Karnataka State in India. He lived from 1238 A. D. to 1317 A. D. He became a Sannyasin when he was only sixteen years old. Srimad Anandatirtha studied the Vedas, Sastras and Advaita classics like Istasiddhi from a guru Acyutapreksa. As he was not satisfied with the existing interpretations of the Brahma Sutras, Upanisads and the Gita, he studied independently the entire sacred literature including Itihasa and Purana. He traveled all over India, and visited the fa¬mous centers of learning. He went up to Badarikasrama where he presented his Gitabhasya to the sage Vedavyasa and received his blessings. Many scholars became his disciples. It was Srimad Anandatirtha who established the now famous temple at Udupi. After establishing the temple he handed over the administration and worship of Sri Krsna to his eight monk disciples, the successors of whom even after seven hundred years are honoring the duty that was entrusted to them by their Paramacarya Srimad Anandatirtha. Srimad Anandatirtha wrote commentaries to the Brahma Sutras called the Brahmasutra Bhasya, the ten principal Upanisads, Bhagavad Gita and on the first forty hymns of Rg Veda. He also wrote ten prakaranas, a book on meditation and worship, and some stotra works. In addition to Bhasya, he wrote another commentary on Brahma Sutras viz. Anuvyakhyana in two thousand verses. In all, he has composed about thirty-seven works. Srimad Anandatirtha lived for seventy-nine years and retired to Badarikasrama on the ninth day of the bright half of Magha month in the Pingala year. Srimad Anandatirtha is the one who advocates the reality of differences. According to him, the Ultimate Reality is one single pervading Brahman that is Hari, the Supreme. He believes that there are five final differences, which are mutually irreducible to each other. They are (i) between God and the jivas, (ii) between one jiva and another jiva, (iii) between God and matter, (iv) between jiva and matter, and (v) between one material thing and another. For him the jivas are dependent for their existence on God, Lord Visnu or Hari, whereas Hari is the Brahman, an independent Reality. Thus the Brahman or Visnu is the all pervading reality and governs the whole of creation and the jivas by making them entirely dependent on Him. He controls from within as well as from without. The distinctions of the Jiva, Prakrti (Matter) and God are fundamental and eternal, and the distinctions are never lost. The souls and Prakrti (Matter) remain existent as entities even in pralaya (the final dissolution of creation), but only in a subtle form. The souls retain their distinctions from each other and from God even in the state of liberation. As Srimad Anandatirtha took a stand that the Jiva and Brahman are eternal two separate entities, his system is called as ‘Dvaita’-the dual system. According to Srimad Anandatirtha the values of M, S and G was invariant like Ramanuja he is not ready to accept that at the end of creation that M and S also tend to become the G. M+S+G = infinity be it during before or after creation and each one of them belong to a inviolable category of their own except under the rarest of the rare case. Superficially it looks as though the Acaryas are quibbling about some finer aspects of the texts. In reality their works have had a tremendous impact on the Indian society. It should be mentioned here that the seeming differences in the stand of the three Acarays disappear when one dwells deep into the very texts that the Acrayas have written. We find the indication that all the three endorsed all the three views as tenable. 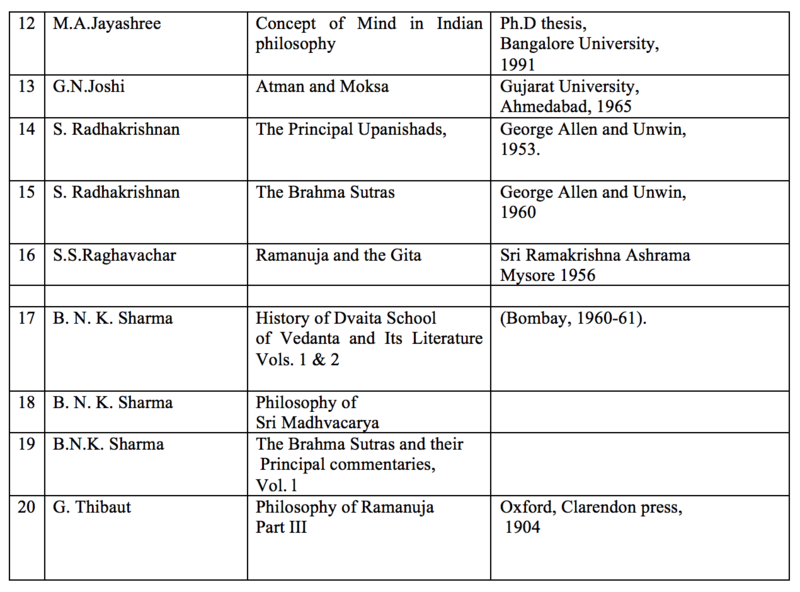 If the emphasis on the Acarays of a specific worldview were to be taken in the context of their times and the society they lived in, then it becomes crystal clear why they took a specific stand in connection with the Prasthana trayee.